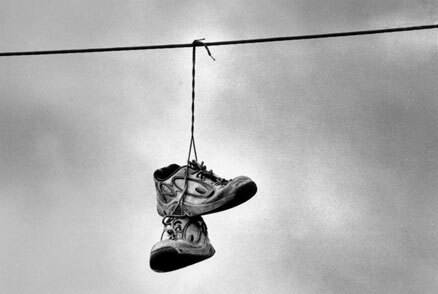 For weeks I saw them just hanging there from the power line. One day I thought about taking a picture but soon forgot the passing notion. It was when Graham Hunter e-mailed me suggesting that I take a picture of this same scene that I returned to reexamine the actual picture potential. While I dodged some passing cars I searched for just the right camera angle and also to contemplate if there was any down to earth significance in this suspended moment. The real importance of many encounters in our life is lost in our translation because we were not there when it really happened. was showing off his great athletic ability and tossed them up there in only one throw? What if they were actually falling downward instead? Let's pretend they fell from an jet airliner's cargo door that was left open. Or just maybe what if some space aliens abducted a Blaine Borderite walking to school and this lonesome twosome just fell out of the guy's gym bag?